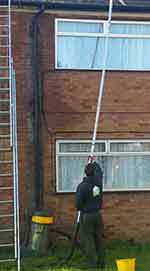 Our Surrey gutter vacuum cleaning service use many different methods to clean guttering, we regularly us gutter vacuum systems and ladders when needed. The advantage of the gutter vac is reaching them awkward spots that would be impossible otherwise. Conservatories and poor access are amongst the most common problems a gutter cleaning service can come across. But the gutter vacuum you can simply reach over the conservatory and squeeze down a tight alley way effortlessly. Unfortunately gutter vacuums don’t always lift heavy growths in the gutters though but don’t worry our Surrey gutter service always manages to resolve the issue and always cost effectively too. Gutter vacuums come in many different brands, we use a quality supplier and our systems have an impressive 4200 watts powering them. This means our machines can lift a lot more then a standard gutter vacuum system in fact it has 4 different nozzles meaning we can clean gutters of all shapes and sizes quick and effectively. We can Use ladders, extension poles, roof ladders and other methods to save customers costly payments on scaffolding. We can come and view your property and give free quotes that are no obligation and if your happy with the quote given the work can usually be carried out within 2 days. In order to receive your free quote please call or email us today.